Coloring your hair yourself can be intimidating — and we’re not pretending otherwise. Many of us leave it to the experts for that reason. It’s also why Madison Reed was started — to demystify at-home hair color, so it’s a cinch to do on your own. Madison Reed's color kit ships with the essentials; plus a few extras to ensure your experience is convenient, relaxing and even a little bit glam.To use a cooking analogy (they’re big food enthusiasts), it’s like having the vegetables peeled and spices measured before you cook. The prep work is already done for you, so there’s no fumbling. No mess. No learning curve. 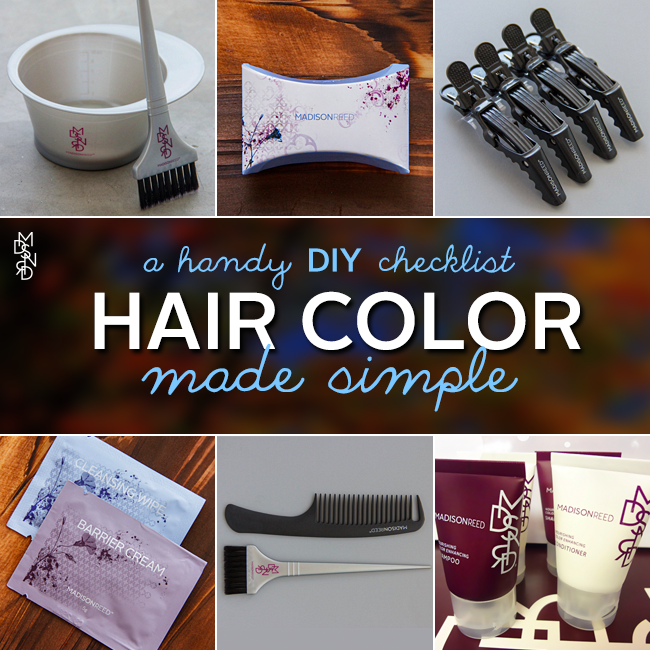 This handy checklist — most of it’s already in the Madison Reed Radiant Color Kit — takes the hard out of hair color for the easiest salon-quality results you can get at home. Some people use vaseline, but Madison Reed includes our own color protection formula. Apply this along the hairline to keep dye off your skin. Don’t forget easy-to-miss spots like the back of your neck and top of your ears. Easy to squeeze? Precise nozzle? Check and check! In soft plastic with a tip applicator, and a screw top, this tool makes anyone a pro. It’s ammonia-free, and not only safe, but also scent free. No one will know your gorgeous color came from a bottle. Form-fitting, high enough to cover your wrists, and in dye-camoflaging black, our gloves are awesome. You get not one, but two pairs; one set to protect hands while applying color, plus an additional set for rinsing in the shower — so no dirty gloves will ever have to touch and stain your counter. Not your finest fashion moment, but if you’re concerned about guarding against stains while hair is processing, this is perfect. Residue on your ears is a tell-tale sign you’ve been coloring hair. Use these after to get ride of the evidence. Don’t forget the back of your ears! For your final step, wash and nourish hair with Madison Reed’s ultra-mild formulas free of sulfates and parabens. Since our formula is cream based and has the consistency of a deep conditioner, we don’t anticipate much dripping. For beginners, it’s still a nice security measure against mess until you get used to the process. Helpful for securing hair into four sections; you can also use rubber bands or hair ties. Using a comb or fingers, take color through before putting on a cap. Short of coloring, ahem, in the buff, this is the next best thing to keep your other clothes dye-free. For super fans, they now have zip-up Madison Reed Salon Smock. Why not make the wait a happy (half) hour? Good Read This is your ‘me-time’ — dive in! Visit Madison Reed and Find your perfect hair color now! I would love to get feedback on Madison Reed hair color! I am 40 now and a grandma so, it's about time I start coloring my hair! I am not planning on coloring at the salon...(that can be a bit pricey for me), especially when you still have a few little zoo animals running around at home! Ok, they are human children, but some days I can't tell the difference!